Core academic subject which aids career progression and combines well with other courses. English Language and Literature is an engaging and popular course which strikes a balance between the two other English subjects. We read a variety of modern texts and there are elements of original creative writing throughout. If you’re not sure which English to do, or you want to keep your options open, then it is a sensible choice. 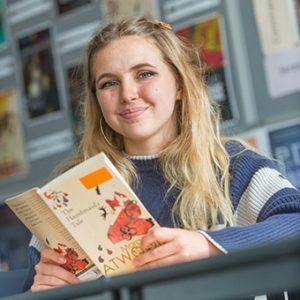 Our focus is on how writers craft a distinctive ‘voice’, so you will study the stylistic features of a wide range of reading material including blogs, magazines, travel writing and novels. We also examine how writers have represented real and imagined places in their writing. The second year coursework project allows you to investigate particular texts and topics that you find interesting in relation to the intriguing gothic novel The Wasp Factory. Throughout this course, we will enhance both your creative and analytical writing skills, as well as developing your enjoyment of wider reading. The aim of this course is to help you read like a writer and write like a reader! Read more about Flora and some of our other students.